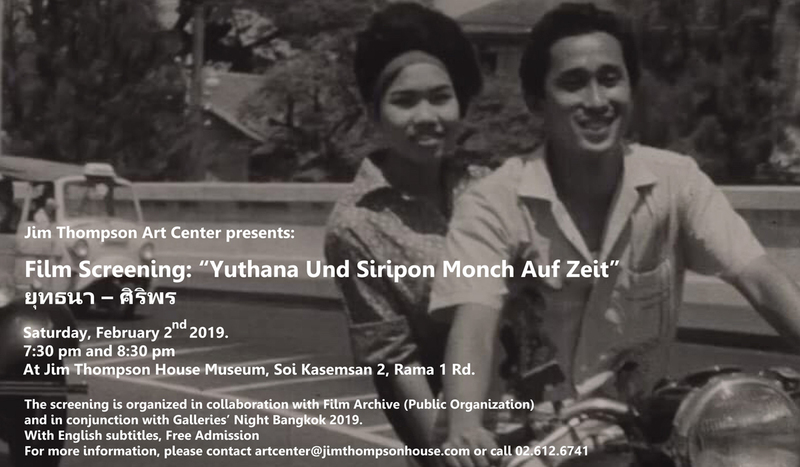 Jim Thompson Art Center in collaboration with Film Archive (Public Organization) is pleased to present the film screening of Yuthana and Siripon (Yuthana und Siripon Monch Auf Zeit), a documentary produced by Hans Berthel, a German director, in conjunction with legendary filmmaker and national artist, Thae Prakatwuthisan. The film depicts the Thai way of life in Bangkok during the year 1963. The story is told through the lives of a young couple named Yuthana and Siripon who experience the beginnings of the influence of Western popular culture. When filming was completed, the movie was released on television in Germany and wholly narrated in German. The film is a valuable record of the era of the early 1960’s from the perspective of a foreigner who looks at Thais, their culture and the Thai way of life. This film was registered in the listing of “Films as National Heritage” in 2015 by Film Archive, Thailand’s Ministry of Culture. Screening date: Saturday, February 2nd, 2019. Venue: Jim Thompson House Museum, 6 Soi Kasemsan 2, Rama 1 Rd. For more information, please contact artcenter@jimthompsonhouse.com or call 02-612-6741. ฉายวันเสาร์ที่ 2 กุมภาพันธ์ 2562 2 รอบ เวลา 19.30 น. และ 20.30 น.